The SL Bar Association recently announced that it will be offering CLE (Continuing Legal Education) credit for legal seminars held in Second Life, starting with SLBA President ‘Solomon Cortes’ (David Naylor) presenting “Virtual World Legal Issues” July 15, 2008 at 12:00 Noon Pacific at the SLBA offices. This marks the first time that CLE credit has been offered for an exclusively in-world event. For non-attorney readers, CLE credit is a big deal to lawyers because attorneys all have to take a certain number of CLE credits each year to maintain state bar memberships — and these seminars can be expensive. The SLBA presentations will initially only be accredited for CLE in California and the United Kingdom, but some other U.S. states accept California accredited CLE programs, and eventual accreditation in other states and countries seems likely if there is interest. The initial SLBA sessions will be offered free of charge to SLBA members — a fantastic benefit given that members pay just L$500 (about $2.20) a year in dues and that mainstream CLE seminars regularly run $100 a seat. Future SLBA CLE offerings may involve some fees, but the SLBA plans to keep the cost well below mainstream CLE — a benefit of holding these in-world. All of the seminars have been approved for California CLE credit except the last, for which approval is pending. Offering CLE in-world is a big step for the SL Bar Association, and I’m really pleased to see it happen. 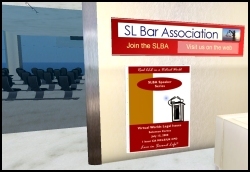 I started the SL Bar Association in late 2006, but had absolutely nothing to do with this effort, which was driven by the current ‘Cortes’ administration and spearheaded by ‘Geri Kuhn’ and ‘Cat Galileo.’ I join a lot of what I know are going to be very happy attorneys who use virtual worlds in thanking them for making this happen.